A standing desk is one of the best ways to get yourself some much-needed exercise and mobility even while being stuck in front of a screen. A standing desk mat supplements the benefits of a standing desk by reducing the fatigue from standing on your feet, through unique textures and design used for production. This means that you will not get tired even after standing for several hours during work. To give you more idea about a standing mat, we are going to review some of the best options available in the market, at the moment, in this article. This mat is specifically designed to keep your work comfortable even when you’re standing. The Licloud standing desk mat features 5 functional areas: the massage ball, teardrop mount, massage point, flat anti-fatigue area, and support mounds. The mat comes with 2 massage balls that allow you to do fun things with it such as fidgeting, flexing, and rolling while on the job. Relieve your foot muscle knots and tension from standing too long by leaning on the massage ball and using your body weight. For hand pressure alleviating, spin the balls on your hand while using the mouse. The massage balls are perfect for relieving pain in various parts of your body, especially those that are stressed from standing for a long time; these include your back, shoulders, neck, hips, arms, legs, buttocks, thighs, and FEET!. These balls can be put in the mat’s built-in holes to keep it within its borders. 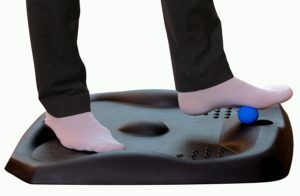 The mat’s teardrop mound relaxes the soles of your feet by giving off a nice massage underneath you. The massage points help with the circulation of blood in your feet and legs and with the muscle engagement of the lower part of your body. Its flat anti-fatigue area allows your feet and legs to take a rest from the stress that the hard floor gives while you’re on duty. Take note that the mat tends to bottom out when used, which means that it won’t support your weight; however, as long as you constantly move or shift your weight from one foot to another, the bottoming out of the mat won’t be felt that much. The travel control of the Licloud Standing Desk Mat is kind of poor as it tends to slip on the floor at times. However, you won’t have difficulty when transferring the mat from one place to another as you can just push it in or pull it out from your desk with just a hook of a foot on one of its ridges. The mat has 5 functional areas to make standing while on the job comfortable and less painful. Ease of transport is the good side of its poor travel control. The mat’s polyurethane construction doesn’t guarantee full and good support. It has poor travel control. With the mat’s compression factor, the teardrop mound and massage stars tend to sag under light pressure. The Comfort Stand HD from Durable Corporation comes in various sizes and a length that reaches up to 30 feet in length. The mat is 7/8 inch thick providing additional comfort in the midst of duty. It’s said that it’s specifically designed to ease fatigue all over the stress that your feet experience from standing for so long. While it’s true that this is the main goal of the mat, its sponge construction gets in the way. The sponge (synthetic rubber) makes the mat less durable as it can be easily ripped off in one simple pinch, showing that there’s a big possibility that this won’t be able to withstand harsh environments. With its notable absence in the durability department, the lack of support also comes together with it. The mat will sink under the pressure of your feet and will eventually as hard as the floor you’re trying to relax from. The construction of this mat clearly negates its primary purpose as it doesn’t spring back under your feet. However, from the entire negative factors of the Comfort Stand HD that have been previously mentioned, there’s one thing that this has that a lot of mats lack. This mat has a good surface traction and travel control that even if it’s placed on a carpeted floor or a smooth concrete floor, it won’t move under your feet. 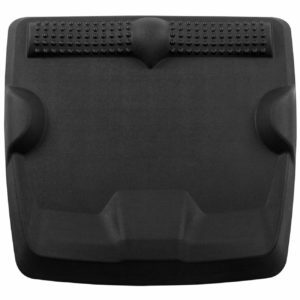 The Comfort Stand HD has a good surface traction and travel control that prevents it from easily slipping around under your feet. The mat features 7/8 inch thickness that exceeds the industry standard. 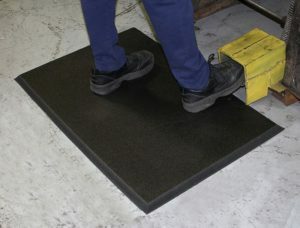 The mat’s overly soft sponge (synthetic rubber) negates the sole purpose of using a standing mat. It doesn’t spring back under your feet. The product noticeably lacks support as it only sinks under your feet and because of this, your joints, legs, and lower back gains pressure and stress, which is the real opposite of what mats are supposed to do. The non-ADA-compliant 13 inch beveled edge increases the dangerous risks of tripping over the mat. The Ergohead Standing Desk Mat is constructed from 100% high resilient polyurethane foam, providing an environmental-friendly mat. With this being said, the mat should withstand normal wear and tear from everyday use. The mat comes with a lot of components to make sure that you get the features they offer in every use. A balance roll, a tear drop mound, side mounds, and power wedge are all put in one mat for optimum performance. The standing desk mat is thick enough to sink under your feet after standing on it for so long. The comfort massage points that come with this unit guarantees proper blood circulation and muscle engagement. The mat provides a large space for standing to allow more stance movements, giving comfort and relief on your feet and legs. In addition to this, it also supports various standing positions. The product also features easy transport with its hands-free edge position that enables the mat to be slid easily. In contrary with the said feature, the Ergohead Standing Desk Mat can be transported so easily that its travel control fell poorly. The mat slides, even in carpeted flooring with just a light push on it. Another thing is that it gives off a chemical odor even if it’s been used for a week. The mat is constructed from polyurethane foam. Its softness makes it ideal for people who would like more cushioning. The product provides a high level of durability for long usage. The mat’s larger space is specifically designed for users to apply different standing movements. Its hands-free edge position allows it to be moved with ease. The unit’s softness minimizes the massage feature that comes with it. The mat being slippery increases risk of accidents. It has an off-gassing issue where a chemical odor is quite noticeable even with long usage. We have reached the end of this article. Hopefully, this review article helped you by providing you information about the type of high-quality standing mats available in the market. This is definitely not an exhaustive list, but we have handpicked some of the best products to ensure that you do not have to worry about the quality or durability after making the purchase.